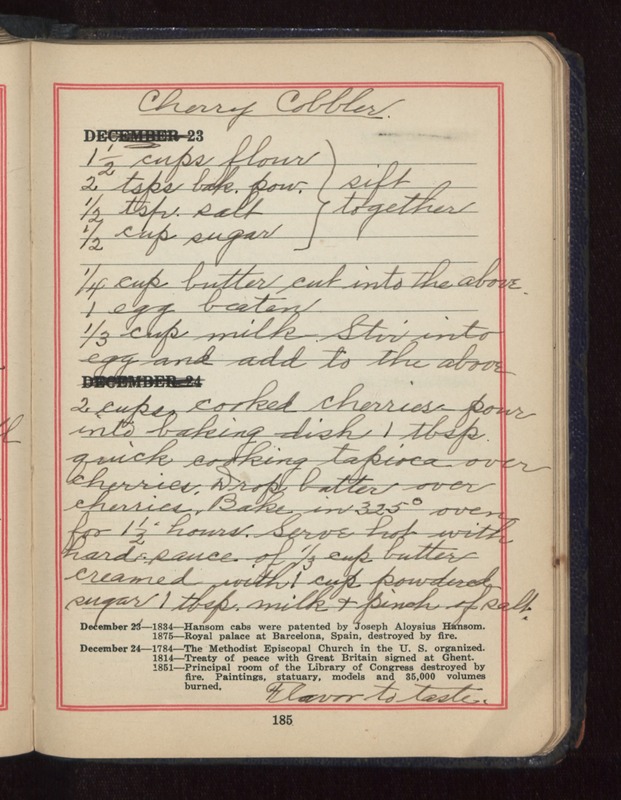 Cherry Cobbler 1 1/2 cups flour 2 tsps. bak. pow. 1/2 tsp. salt 1/2 cup sugar Sift together 1/4 cup butter cut into the above. 1 egg beaten 1/3 cup milk Stir into egg and add to the above. 2 cups cooked cherries pour into baking dish 1 tbsp quick cooking tapioca over cherries. Drop batter over cherries. Bake in 325 degree oven for 1 1/2 hours. Serve hot with hard sauce of 1/3 cup butter creamed with 1 cup powdered sugar 1 tbsp. milk and pinch of salt. Flavor to taste.